Georgian former boxing champion Avtandil Khurtsidze has been sentenced to 10 years in prison for working as the "chief enforcer" for an "elite" criminal enterprise. Prosecutors said the 38-year-old boxer had "substantial influence" in the criminal underworld as part of a Soviet Union crime gang. They said Khurtsidze used violence in service of the group's activities. Many of the crew's activities were based in New York but they also operated in other major cities as well as abroad, a justice department statement said. 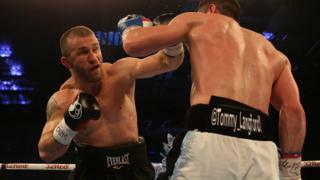 Khurtsidze was caught on film twice carrying out assaults, with prosecutors describing him as a "heavyweight enforcer" for the group's members and leadership. "Thanks to our dedicated law enforcement partners around the globe, Khurtsidze's reign of extortion and violence has been halted," US attorney Geoffrey Berman said in a statement. "He let many people down who believed in him, but no one more than himself. Just a waste, and it's all on him for choosing the dark side," Mr DiBella told ESPN.